I hope all is well with you. Besides enjoying Spring rain showers, fresh blooms, and trying to keep the weeds down, I’ve been feeling like our cat lately. Not in her ability to run and jump—wouldn’t that be fun—but in the way she often chases her tail. Just wish I could make all my busy errands fun and games like our Lucy cat does. 🙂 On a high point, my boys’ high school baseball team advances to the State Championship game this weekend. I’m both excited and proud of their accomplishent. My daughter’s Jr. High softball team is also undefeated. My oldest son graduates in a week, which makes me happy-sad. Happy for his achievements and hopeful for his future plans, but also sad that he’s about to launch from the nest. In all the busyness and fluctuating emotions, however, God’s blessings are abundant. I’m especially thankful for the relationship I have with my Lord, Jesus Christ. He’s the true glue that holds me together: both in the happy, smooth times and also when I’m spinning in circles chasing my tail. In continuation on the fundamentals of our Christian faith, based on the Apostle’s Creed, here is another great podcast message from my Pastor Cliff Purcell: Jesus: Christ. Son. Lord. (May 20, 2018). This entry was tagged Christianity, Colossians 1:16-17 - "in Him all things hold together", fundamentals of the Christian faith, Jesus is all sufficient, Laminin (shaped like a cross) holds our cells together, Pastor Cliff Purcell podcast: Jesus: Christ. Son. Lord., The Apostles Creed, who is Jesus?. Bookmark the permalink. Congrats KD on all the championships and graduations—a happy and yes, sad time all rolled into one as transition is on the horizon—but what a joy knowing God has all of you in His hands!! Thank you Julie! I appreciate all of your encouragement! Although busy, it’s definitely a fun time with the kids. And yes, what a great joy and privilege knowing God is with us and has our days written in His book. Blessings, Friend! 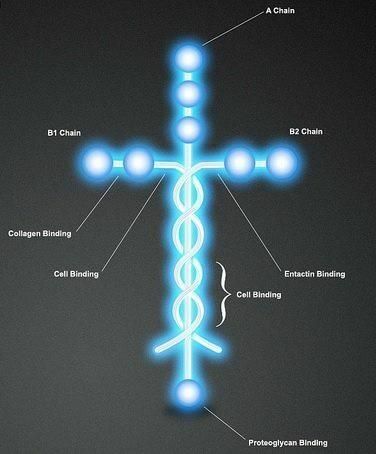 I first heard about Laminin from a message by Louie Giglio. So powerful! It is fascinating! Grace and blessings to you!